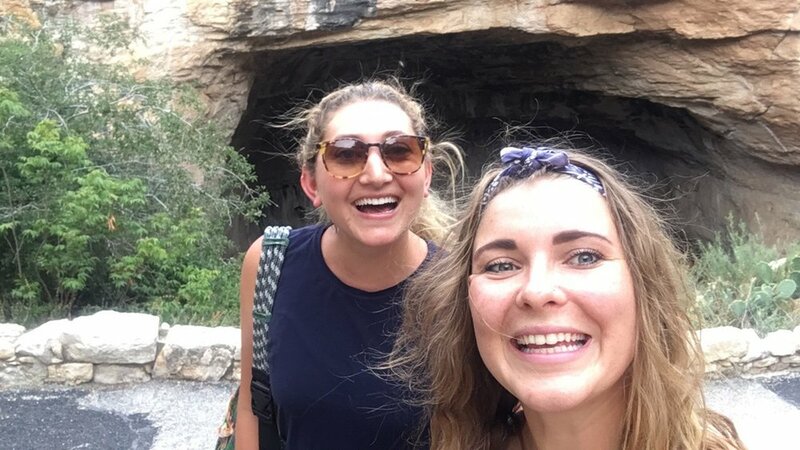 Lucky enough to get to spend an afternoon at Carlsbad Caverns with my gurl Han before she had to go back to the real world. We timed it perfectly so that we got to hike down the natural entrance, around the big room, and then back up in time to see the bat exit! The caves were beautiful and dark as always. Again, most of the trash we found was at the concession stand/ bathroom area and again, most of it were plastic water bottles. Look at all dat plastic! Earlier that day we had hiked the Guadalupe Peak so our plan had been to feel it out and maybe take the elevator up. But given that it was the end of the day the line was ~HELLA LONG~. So we just said eff that and booked it up. Honestly, I kind of love walking up because everyone who is walking down is super impressed. PLUS it really doesn't take that long. We did it in 23 min! Which was probably less than half the time we would have been waiting in that GD line. When we reached the sky we struck up a conversation with the ranger stationed there. GUESS WHERE HE WENT TO SCHOOL!??! The University of FRIGGIN MAINE!!! AKA the school that is 20 mins away from my home, where my younger brother attends, and where my mother works!! I flipped out even more when I found out he was studying communication AND THAT'S WHAT MY MAMMA TEACHES!! WHAT a SMALL WORLD! I was actually just talking with my mom and she said she ran into him at the UMaine job fair!!! Gah how crazy. I think I was more excited about it than he was but JESUS us Mainers in Texas gotta stick together!! After that joyous interaction we had about two hours until the bat flight program so we decided to hit up the Visitors Center. While up there we ran into my ranger friend Aubrey who happened to be leading a program about cave paintings!! So we attended that and then scooted down to the amphitheater facing the natural entrance and waited for the bats! Everyone had to turn their phones off so as to not disturb the lil bats so I only got a photo pre flight but HOLY FREAKING MOLY! I'm so glad we stayed to see the exit! It was a magical experience to see the bats emerge from the depths of the cave in swarms and spiral together against the setting sun. They looked like puffs from a smoke stack as they flew towards the rivers on the horizon to feed. They just kept coming and coming! Like we were there for 45 mins and we didn't even see them all leave the cave! SO COOL. ANOTHER BEAUTIFUL DAY IN THE BOOKS. Not a bad place to live, bats. I have been contemplating my relationship with art and the large amount of waste it can produce. I wanted to find ways I can validate art and its important purpose by working with recycled materials found in National Parks and other landscape environments. With 2016 having been the 100th anniversary of the National Park Service, I have especially appreciated, and been inspired by, the natural beauty that the parks offer, and found how easily we can take these precious places for granted. For each National Park I visit, I plan to gather as much trash as I can, sculpt it into a canvas, and paint the scene where the trash originated onto the trash itself. So far I have collected trash from Acadia, Rocky Mountain, Arches, Zion, Grand Canyon, Joshua Tree, Pinnacles, Channel Islands, Sequoia, Kings Canyon, Saguaro, Guadalupe Mountains, Carlsbad Caverns, Big Bend, and Petrified Forest National Parks.